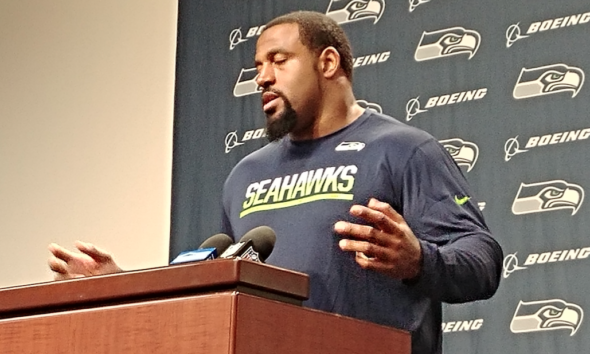 The contract extension for LT Duane Brown, a five-time All-Pro, is reportedly done, keeping a commitment the Seahawks made when he was acquired at midseason last year. A new deal for holdout FS Earl Thomas doesn’t seem in the mix, but the Seahawks like them some Duane Brown. A lot. Pro Football Talk reported that the five-time All-Pro left tackle, 33 next month, is getting a three-year extension through 2021. The Seattle Times reported the deal could pay him up to $46 million, but the amount of guaranteed money has yet to be disclosed. He was booked to receive $9.75 million this season, the final year of a contract the Seahawks inherited in a 2017 mid-season trade with Houston. Brown held out the first the first eight games of Texans’ season, coming back in the ninth game against Seattle at the Clink to assure his eligibility for free agency in 2019. That could be the scenario that plays out for Thomas, who is sticking to his vow not to show up until he gets an extension. There has been no indication from the Seahawks or Thomas’s side that negotiations are underway. Thomas, 29, was on the trade block throughout the off-season, but the Seahawks’ reported ask of a second-round pick — for a potential one-year rental — went unmet. The Brown extension had been anticipated because the Seahawks so valued anchoring the most important position in their often-dubious offensive line. Since Russell Okung departed in free agency following the 2015 season, the position has been a mish-mash of players either injured or under-qualified to protect QB Russell Wilson’s blind side. “Duane made an immediate impression on us when he got here,” Carroll told reporters as camp opened Thursday. “This is a real leader. He’s a real man in that huddle and in the locker room, and we’re very, very fortunate to have him. Brown was non-committal Thursday when asked about the pending extension. “I’m just out here working, man, focusing on my craft,” he said. “I’m excited to be out here. This is my first training camp in a couple years, because I was injured the year before last. Whatever it takes, we do have what appears to be the best LT since big Walt . . .
That is what I meant, but I don’t know if they restructured his 2018 compensation. I am just an uninformed observer, but I think Earl Thomas is making a mistake by holding out. Perhaps his present position is motivated by the ever-present risk of injury. Barring that, It seems to me that his primary objective would be to maximize his income. If he reports to camp, that guarantees he will collect every cent of his $8.5M salary. Then at the end of the season, presuming that he makes a valuable contribution, he can test the waters for other offers, and if the Seahawks can’t or won’t match them, it’s Sayonara. Kind of similar the deal Golden Tate got from Detroit. His primary goal is maxing out his salary over several years, not just this year, and he thinks someone in the market will give it to him. The Seahawks, having extended Chancellor and Bennett only to see them get hurt, are not in the mood to get burned again. It’s all about pay and fun. How do you get both? It’s possible. European football (soccer) for example. They all seem to be having fun with few complaints. Our system has two fatal flaws. 1. For one person to make money, another has to lose money. Example: Average Seahawk ticket prices were $400 to 480 in 2017. 2. The object is to make the most money while expending the least effort. Example: What, exactly, did Paul Allen do to earn his money? The problem is our chance of getting rich is nil. Worse than the lottery. There are 327 million Americans. 32% live in or near poverty**. That’s 1 out of 3. There are better systems out there. Just ask the millennials.